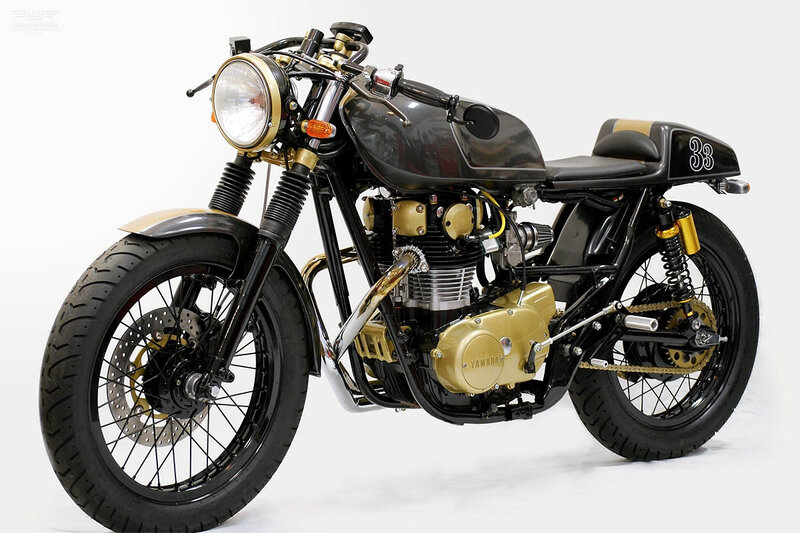 Today’s feature bike a Yamaha XS650 Cafe Racer comes from Chappell Customs, the garage built motorcycles of the Chappell brothers. We asked the brothers about the road they have taken to reach where they are today, how their unique situation works and of course the story behind this build. Here’s where we hand over to the brothers…. From the time the Chappell Brothers were little boy’s they were obsessed with building and creating things. “I recall being 5 or 6 and taking scrap pieces of wood, the cut-offs my father didn’t need, and grabbing any nails he didn’t care to use and assembling them into skyscraper works of wood art. Well it was art to me anyway.” says Rob. At age 11 for Rob, 8 for Chris, their father showed up with a surprise, a minibike that they “weren’t allowed to ride on the street!” It was a used 1973 Honda ST90 in beautiful lime green. “We kind of thought it looked like a moped, but hey, it had an engine and was faster than our BMX bikes.” Says Chris. That mean green machine started their love affair with dirt bikes, tweaking and making them faster, and as they got older the interest moved over to street bikes and hot rod cars (but that’s another story) and the customizing has never stopped. “We grew up building together and we don’t think that will ever end.” Says Rob. Chris now lives in Los Angeles and Rob still lives in Ontario Canada so the hands on building takes place on vacations (usually twice a year) and the remaining time and direction comes from late night phone calls and skype when not face to face. “It’s a strange relationship but we’ve made it work out for each other so that each bike we build has a bit of each of our styles embedded into the final product.” Says Rob. 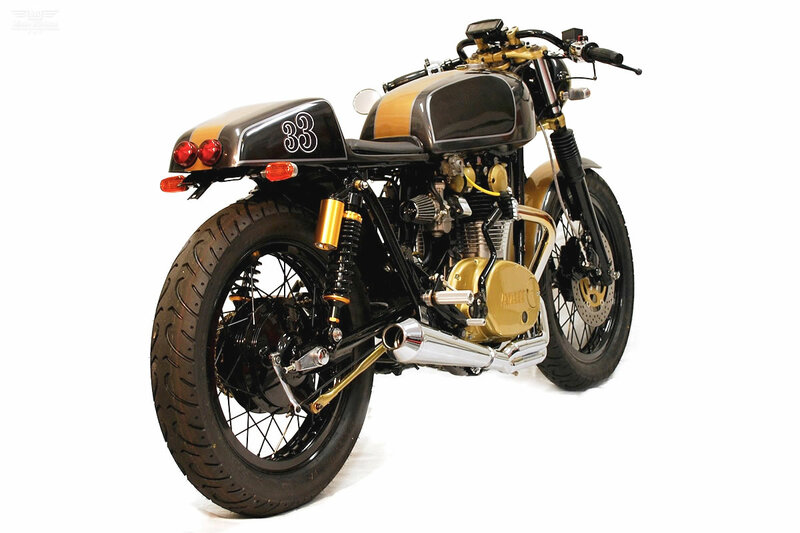 “This Yamaha XS650 cafe started as a non-running basket case, basically we only kept the engine and frame, which we modified with a custom rear hoop and pan for the lithium battery and all electrical. The forks were from another leftover project and the wheels we’re sourced from forums. 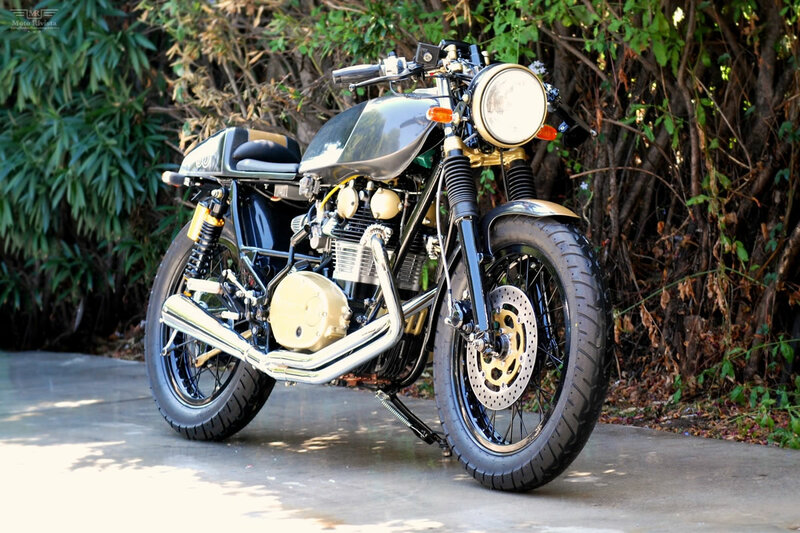 We rebuilt the engine – cylinders honed, new piston rings, valve job, all new gaskets and seals – we also added hi-performance clutch plates and springs.” Says Chris. The bike has progressive front suspension, gas shocks on the rear, performance brakes, billet rearsets, full lights, digital gauges and custom LED indicators put into the headlight bucket for turn, hi/lo and neutral. We welded a spark plug socket to the kick starter, used a XS750 tank that actually holds a fair amount of fuel, fitted some aftermarket carbs that actually work, a nice exhaust system and a working electric starter. 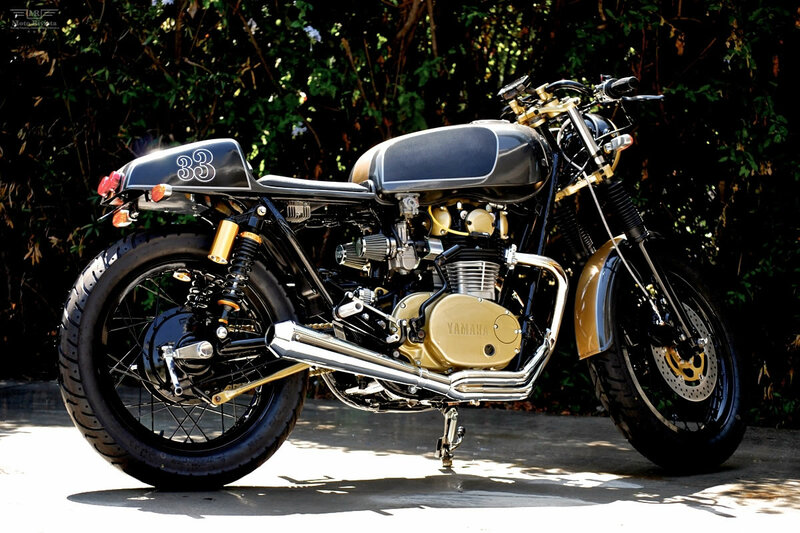 The Yamaha XS650 is another example of true passion and great craftsmanship. 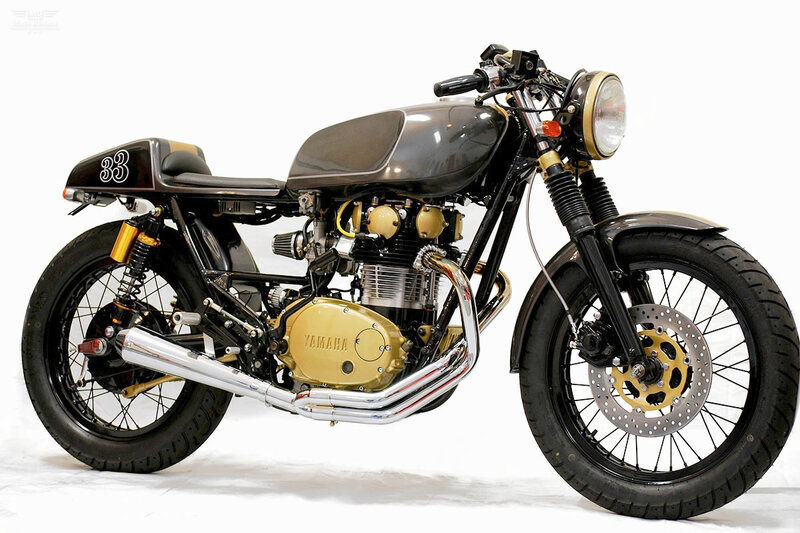 Different geographical locations do not prevent these brothers joining together and creating something as unified as this Yamaha XS650. 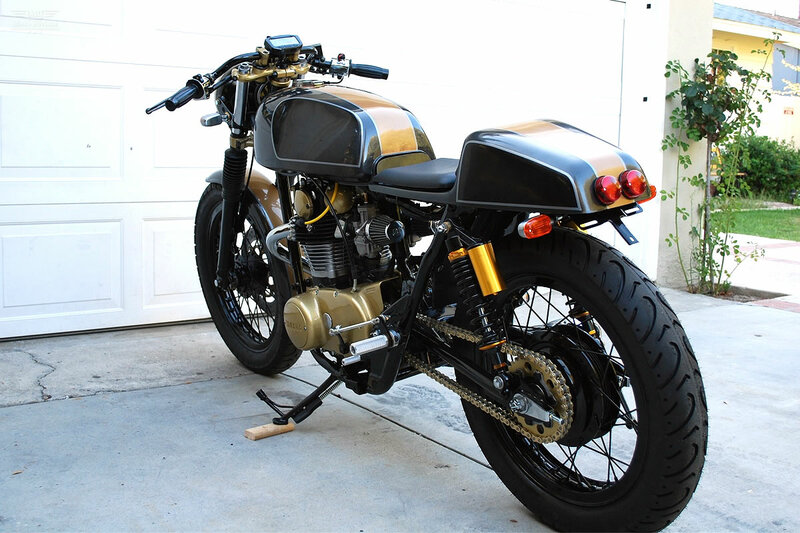 I love every thing about this bike but my personal favorite is the color combination and the XS750 fuel tank, which flows smoothly with rest of the bike. We will be keeping a close eye on the Chappell brothers for their next build! Also check out Chappell Customs You Tube channel for some videos on this build.